Kelly Cartwright's baby is sick and she's looking tired. New mum Kelly Cartwright's heartbreaking post about her sick baby. 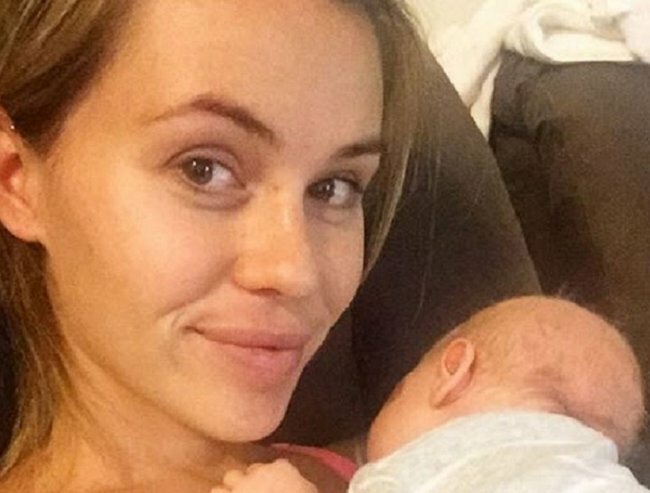 Former Dancing With the Stars contestant, Kelly Cartwright, gave birth in January this year and the new mum has just shared a very honest parenting experience on Instagram. The 26-year-old Paralympian shared a photo of her sick three-week-old baby, Max William Miller, sleeping on her chest. Kelly Cartwright and her sick baby, Max. Image via @kellycartwright Instagram. She explained that her new motherhood role had been really hard over the past week. "I&apos;ve had a tough week seeing my little man in pain, he will only sleep on our chests and when he&apos;s on his back he screams." The young mum said that she had been dedicated to trying to make her little man happy while he was slowly recovering. Max is three. Image via @kellycartwright Instagram. "I spend most of the day like this... Feeding then not daring to move him! His tummy is slowly getting better but I just feel so bad there&apos;s not much I can do!" she wrote. "Not going to lie though I do love him snuggled right there! Here&apos;s to hoping he sleeps tonight!" Many of Cartwright&apos;s followers were concerned about the tired mum and her sick newborn, with many reaching out to ask what had happened and if there was anything they could do to help. Cartwright replied to those caring comments and said that she believes the antibiotics had a bad impact Max&apos;s tummy. "We have got some [baby probiotics] just trying to make him take them! Hope they work I&apos;m taking some too in hope they get through to him," she wrote. We hope he gets better soon Kelly, and we hope you both get some sleep. What&apos;s the worst illness your baby or family member has ever had?